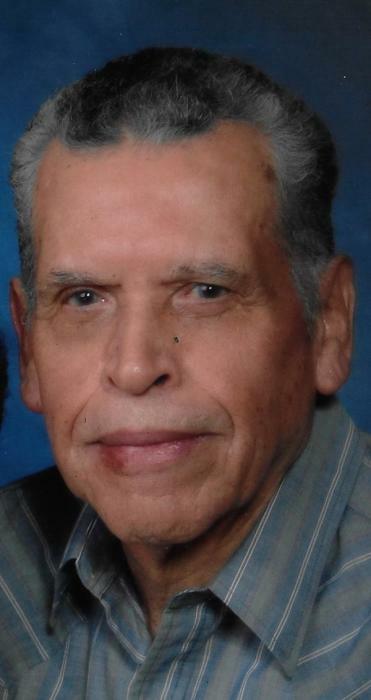 Isauro "Ike" Flores Aguilar Sr.
Isauro “Ike” Aguilar Sr., 93, of Wellington, passed away, Wednesday, November 21, 2018, at his home with his family by his side. Rosary Services will be held at 11:00 A.M., Tuesday, November 27, 2018 at St. Anthony/St. Rose Catholic Church. Visitation will be Monday, November 26, 2018 from 9:00 A.M. until 8:00 P.M. with the family receiving friends from 6:00 until 8:00 at the Shelley Family Funeral Home in Wellington. Interment will be at the Prairie Lawn Cemetery in Wellington. A memorial has been established with the American Heart Association and may be left with the Shelley Family Funeral Home 704 N. Washington, Wellington, KS 67152. Isauro Flores Aguilar Sr. was born on June 14, 1925, the son of Ladislao and Maria Jesus Flores Aguilar in Irapuato, Mexico. Isauro came to the United States to make a better living for his family in which he succeeded. On October 3, 1959 he was united in marriage to Lola Abasolo at St. Anthony/St. Rose Catholic Church in Wellington. They were married 59 years. He worked at Cargill over 25 years. He enjoyed going to the Commodore, family, friends, going to the casino. Isauro shared a birthday with a grandson, Derek Harrison. He is preceded in death by his parents, his daughter, Margaret Aguilar; a great grandson; a son, Isauro (Ike) Aguilar Jr.; 4 sisters, 4 brothers, and grandson, Javier Zavala.